This is the MESS Hall “Counter”. Where kids can order experiments to perform on their own. Off towards the right is a counter. This is where the MESS Hall definitely has a leg-up on other science centers. On the counter is the MESS Hall’s “menu”. There is a list of experiments that the kids can choose from. This list changes daily, so repeat visits are definitely in order. 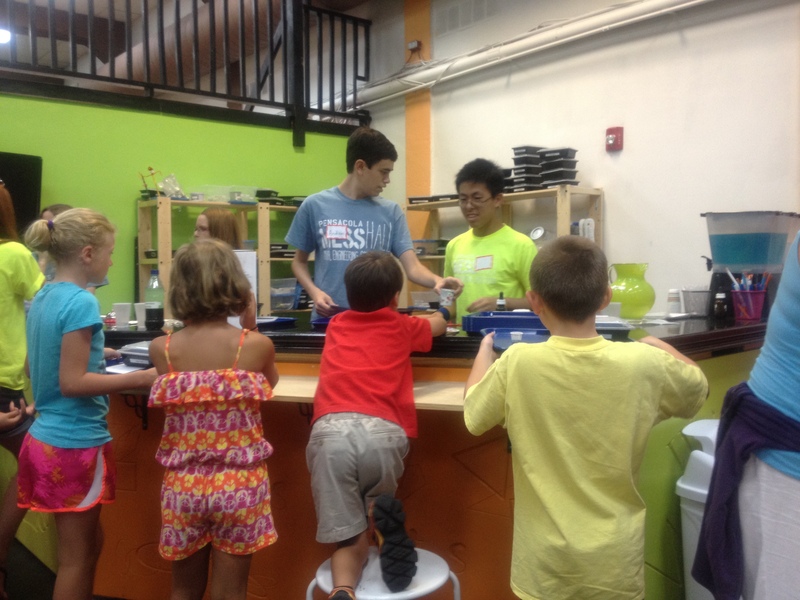 The kids place their experiment “order” with an attendant behind the counter, and they can watch the attendants assemble the supplies for the experiment on a plastic meal tray. And the kids then take the tray, seat themselves among the tables and chair and work on their experiment. Timmy’s doing the “Taste Test” experiment. What a face! 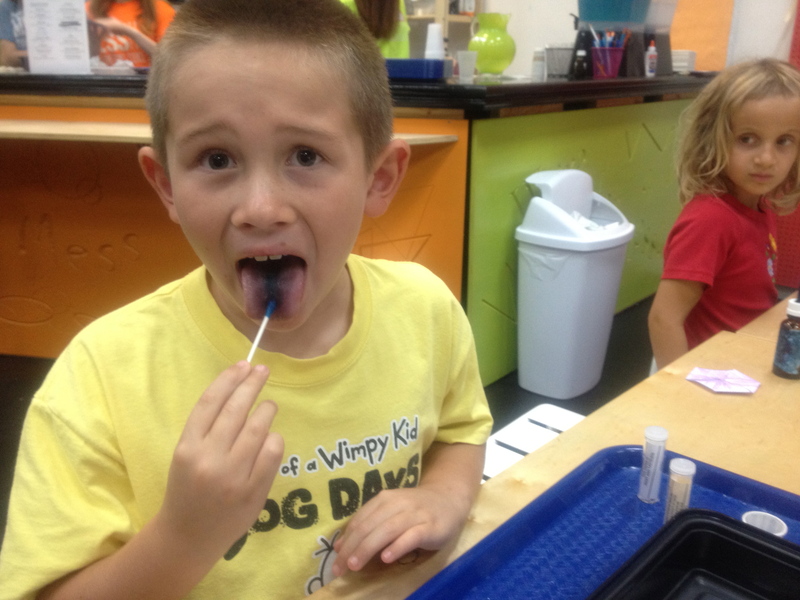 He tasted a strip of paper with the compound PTC on it and we discussed why he could taste it or not. Most of the experiments will culminate in something that the child can take home. The instruction book clearly states which supplies are for the guest to keep, and which supplies need to be returned to the counter. Examples of what my kids explored were homemade magnets, homemade slime (something we did for a class Halloween party when Jacob was in 2nd grade, actually), paper marbling with shaving cream and a taste-test using PTC, a molecule whose taste can only be detected in some humans. Many of these experiments can be done at home with materials on hand, but at the MESS Hall the materials are presented up front — included in the admission — and there’s plenty of space to make a mess (no pun intended). 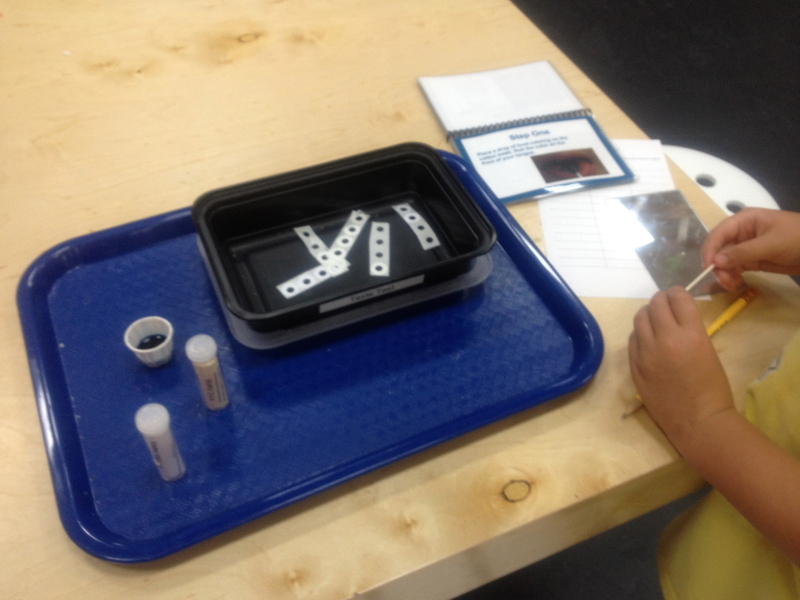 This is how an experiment is presented: a blue tray with the materials and a laminated bound instruction booklet. When the guest is finished with experiments, he can then spend time at the puzzles table, or go explore the wind tunnels or pendulum-based harmonograph. I had the chance to meet Dr. Megan Pratt, one of the founders of the MESS Hall, a neurobiologist by trade, and also one of the at-large members of the Pensacola City Council. An interview with her about the MESS Hall is in the Pensacola Digest article I had linked above, and she and I had a similar conversation about the future of science education and how a facility such as the MESS Hall can help kids take science/math learning beyond the classroom walls. Dr. Pratt wants the kids to explore through the scientific method, and not necessarily have to have a right or wrong answer. 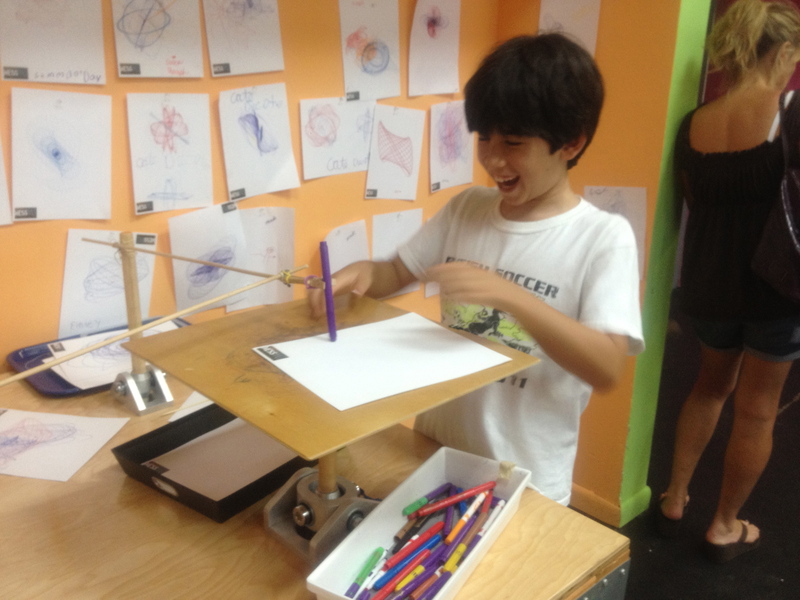 Jacob LOVED playing with the harmonograph, which uses a swinging pendulum to control the movement of paper under a stationary pen. Spirograph-type pictures will be drawn. There are attendants throughout the facility. High school and college kids, by my observation. They walk up with other experiments for the kids to watch. I was reminded of Mr. Wizard’s World on Nickelodeon, where the experimenter would ask “What do you think will happen?” to the kids before the experiment was presented (hypothesizing). Then the kids are asked what they saw (observing), then they’re asked what might happen if a part of the experiment was changed (control vs. variables), and finally, the kids are offered a chance to draw conclusions. 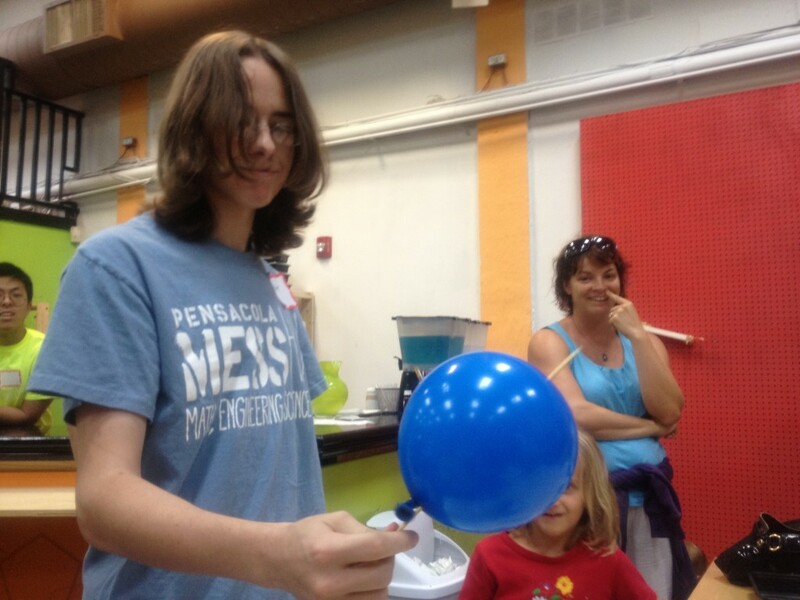 This young man was walking around showing the kids how to punch a skewer through a balloon without popping it. My kids got to watch a skewering of a balloon this way, and later on Timmy got the chance to try the experiment on his own. We arrived at the center at 12pm and were sorry to have to leave at 2pm. There was a lot more we could have done but we will simply need to pay another visit before August 18th. 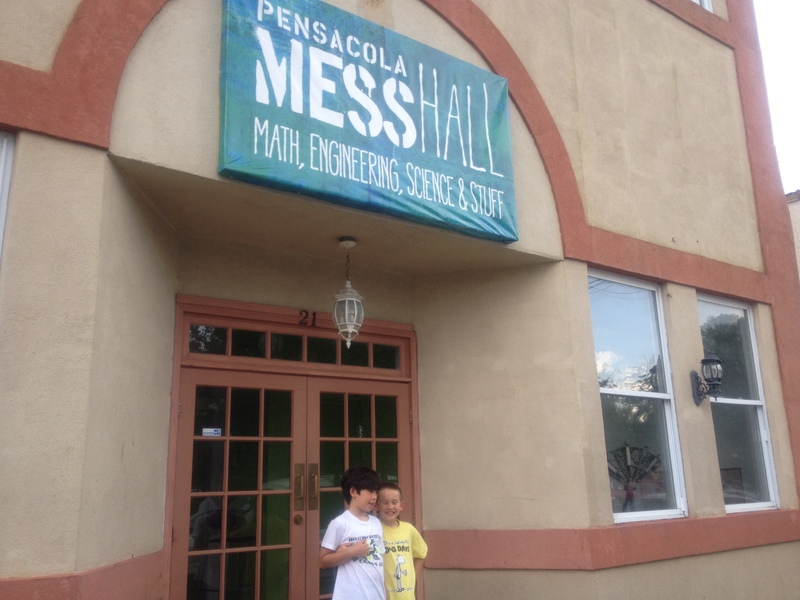 The Pensacola MESS Hall is on 21 West Romana St. in Downtown Pensacola. It’s open on Wednesdays – Fridays from 10-2, and on Saturdays from 10-5. The facility will be closing on August 18th and will be starting a fundraising campaign. It needs capital to move to a larger facility and sustain itself year-round. Learn more through their website and their Facebook page.